Another SUV from Mitsubishi is on its way. It’s not exactly news that Mitsubishi has found its place in the SUV and crossover segments. The Eclipse Cross surpassed over 80,000 global sales within its first year, while the Outlander and Outlander Sport drew in medium-sized families. However, a recent press release indicates that this new vehicle will blend more SUV capability with electric vehicle efficiency and technology. Mitsubishi names this one after an Alpine town: Mitsubishi Engelberg Tourer. 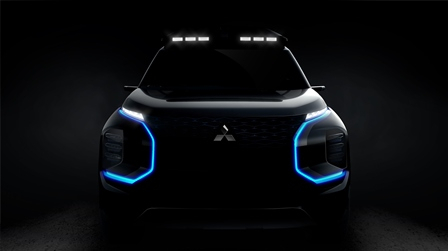 In its teaser image, you will notice some similarities to past Mitsubishi concepts. The massive grille connects to its thin lights, while two blue LED components run down the front to the lower bumper — perhaps cluing us in on its electric powertrain. On the top of the vehicle, a couple sets of LED lights shine in the darkness. Apart from the front emblem, everything else remains a mystery for now. Mitsubishi will likely unveil another mystery photo in the near future. Expect to see this concept debut at the Geneva International Motor Show on Tuesday, March 5, 2019. The Geneva auto show’s official press days will be March 5 and 6. Displays will be open to the public for the following 10 days. Until then, you can stare at this photo and imagine what Mitsubishi has in store with the upcoming reveal in Geneva.